Larry and Pam Spain are the owners and operators of Misty Blue Acres LLC Carriage Company. With over 35 years of experience in the horse industry, they offer a safe, secure and memorable event. All horses are well trained, traffic safe and have been used for many different types of events including weddings, princess parties, city events and therapeutic riding. Both Larry and Pam work in the business preparing horses and decorating carriages for that Special Day. They offer several different types of carriages, including a Cinderella carriage, a wagon and a sleigh for that Holiday Party. 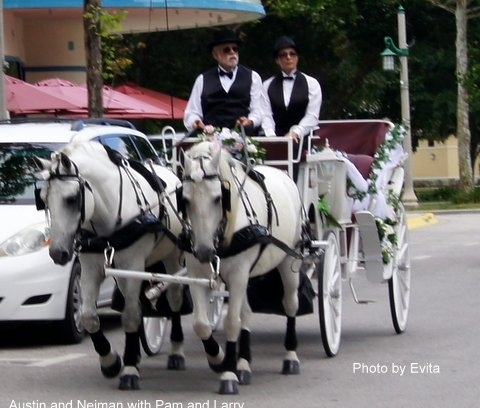 Misty Blue Acres Carriage Company is the official Carriage Company of Celebration, Florida. A Disney built community of around 9000 residents. We provide horseback riding and wagon rides to Give Kids the World, an organization that works in conjunction with organizations such as Make A Wish Foundation to provide families with children who have a life threatening illness, a free week vacation in central Florida. Give Kids the World, is a village that provides housing, dining, water parks and other activities such as making arrangements for the families to attend all central Florida attractions. Call Us Today at (386) 334-4386 for information on how Misty Blue Acres Carriage Company can be part of your Special Day.